It may seem a bit un-American, but I'm not a huge fan of pumpkin pie. I don't dislike it, per se, but if there are any other dessert options, I'll choose them over the pumpkin pie. So I decided to add another dessert option to the Thanksgiving feast, but I wanted to keep it as simple as possible. 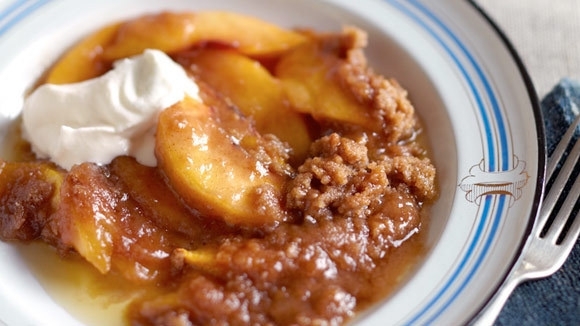 A friend shared her very Southern mother's recipe for peach cobbler, and after we tried it for Canadian Thanksgiving, it became our go-to dessert year-round for family dinners and potlucks. There's just one important tip to remember. As hard as it is to NOT eat it while it's hot, you really should wait until it cools to room temperature to serve it. Once it cools, it takes on a slightly chewy texture that puts this dessert over the top. 1) Melt butter in 2 qt. baking dish while preheating oven to 350 degrees. 2) Mix t/g dry ingredients in a bowl. 3) Drain peaches, keeping the juice. Cut peaches into chunks. 4) Mix peach juice with dry ingredients and pour into the baking dish with melted butter. 5) Spoon peaches over the top. 6) Bake 30-45 minutes, or until brown on top. Note: This recipe does not double well. Youâ€™ll need to cook it longer, and it may never brown.